Sgt. 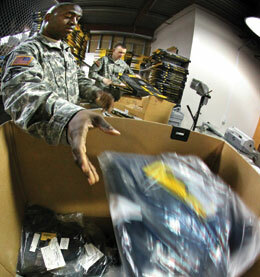 1st Class Marcus Baker, front, packs bulletproof vests while Staff Sgt. Toby Tirrito, back, both with Joint Force Headquarters - New Jersey Homeland Security Center for Excellence, removes donated vests from their boxes on Oct. 14, 2010. The vests, all of which have expired, were donated by the New Jersey State Police; part of a larger vests donation of approximately 2,000 vests from various state and local agencies under the Department of Justice's International Criminal Investigative Training and Assistance Program. These vests despite having past their expiration dates are still useable and will be shipped to the Republic of Albania under the civilian to civilian portion the State Partnership Program. The vests have been sent by container ship to Albania and are due to arrive there mid- January. New Jersey and the Republic of Albania have been partners in the State Partnership Program for 17 years with New Jersey providing Albania critical assistance to help it join the North Atlantic Treaty Organization (NATO) on April 1, 2009. Photo by Mark Olsen, NJDMAVA/PAO. Soldiers and Airmen of the New Jersey National Guard, from left to right, Staff Sgt. James Linnus, Senior Master Sgt. Paul Thompson, Master Sgt. Earnest Williams, Master Sgt. Christopher Schmidt, Staff Sgts. Frank Dobos and Anthony Seay, Senior Airman Omar Navarro, Sgt. 1st Class Glenn Jensen, Master Sgt. Bobbi Panger and Staff Sgt. Armando Vasquez, pose with Medal of Honor recipient Staff Sgt. Salvatore Giunta, center, as part of the New York Jets 11th annual Military Appreciation Day on Nov. 21, 2010. At both the game's beginning and halftime show, Soldiers, Airmen, Sailors, Marines and Coast Guardsmen unfurled a massive fl ag on the field. F-16 Fighting Falcons from the 177th Fighter Wing performed a fl yover at the beginning of the game. In addition, a ceremony in honor of Giunta, the first living recipient of the Medal of Honor since three service members from the Vietnam War were honored in 1976, was held. Also in attendance was Chief Master Sgt. of the Air Force James A. Roy. Photo by Master Sgt. Mark C. Olsen, 177FW/PA. Displaying signed copies of the Army Community Covenant are, left to right, Maj. Gen. Glenn K. Rieth, The Adjutant General; Robert J. Maguire, Civilian Aide to the Secretary of the Army; John Newman, Senior Advisor to the Assistant Secretary of the Army for Manpower and Reserve Affairs; Jon Runyan, Congressman-elect, Third District; Vicki Baker, Gold Star Mother; Timothy Borsetti, Mayor of Lakehurst; Tom Kelahar, Mayor of Toms River and Violet Elaine Marigliano, U.S. Army One Source during a ceremony at the National Guard Consolidated Logistics and Training Facility, Joint Base McGuire-Dix-Lakehurst on Nov. 9, 2010. The Community Covenant program is designed to foster and sustain effective state and community partnerships with the Army to improve the quality of life for Soldiers and their Families. While the Community Covenant is an Army program, it extends to the other Military Services as well, recognizing that many community efforts support all Service Members and their Families regardless of the uniform they wear. Photo by Master Sgt. Mark Olsen, 177FW/PA. Lt. Gov. Kim Guadagno was given an orientation flight on an F-16D Fighting Falcon at the 177th Fighter Wing, New Jersey Air National Guard, on August 12, 2010. U.S. Air Force Photo by Tech. Sgt. Mark Olsen, 177FW/PA.